Between "busy" and "distracted" I can't seem to focus when I get to the computer! I've been going through old notes trying to recall how to do techniques...nothing to rave about, but it's nice (in my own mind) to know what I was talking about when I wrote it all down! a stunning image with wonderful tones and a great composition, fav! What a perfect choice of flowers for that vase. Or is it a trick? Stunning image! So good when you can understand your own notes! I seem to write in Chinese when taking notes! Lol! So gorgeous - the colors and shapes lead the eye through the entire image. Very pleasing. As always, this is just delightful! It's a beautiful soft image, I love it. This is lovely. 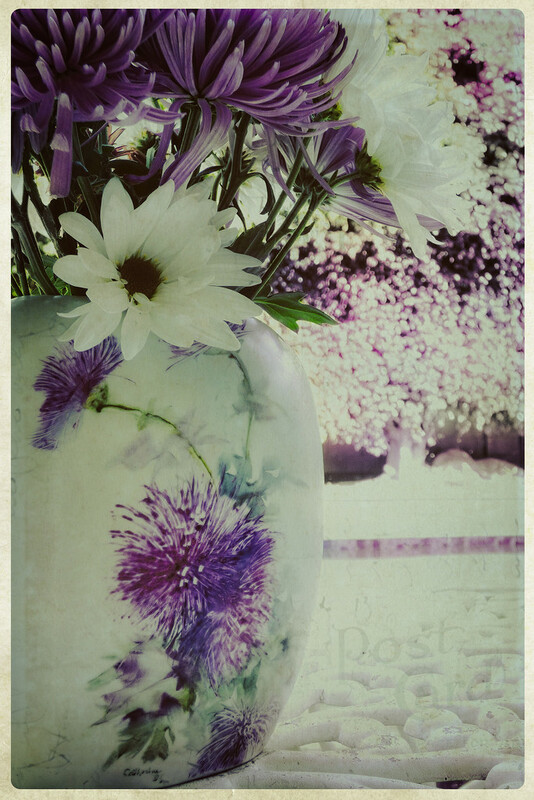 I agree with @casablanca, I think it is the vase and that marvelous background that look like the 50’s. Very nice. Like the use /returns of the purple colors .Great shot. @ludwigsdiana @mariaostrowski @henrir @pamknowler @gilbertwood @joansmor @merrelyn @365karly1 @jamibann @judithdeacon @koalagardens Thank you all for the kind notes. I was on the wire about this one, myself, but it was an excellent exercise for me along the way. Your support is most appreciated! Lovely colours Louise, you're such a creative woman. Wish my brain worked that way. @Weezilou Ha ha, you could be right there......or perhaps magenta coloured glasses!! Pretty capture and flowers and a great composition. @casablanca Once more, I have to bow to your keen eye! Magenta it is! @Weezilou Ha ha, big smiles!